The Pinyon Jays (Gymnorhinus cyanocephalus) - also known as Blue Nutcrackers or Maximillian's Jays - are colorful members of the crow family. They are found on the lower mountain slopes of the western United States. As suggested by this species' common name - these jays are closely associated with pinyon (pine) trees, which they use for cover, nesting and feeding. In fact, in years when the pine seed crop is low, the population of jays typically drops. Even though these birds are mostly sedentary (non-migratory), they will disperse far from their home range when food is no longer readily available. 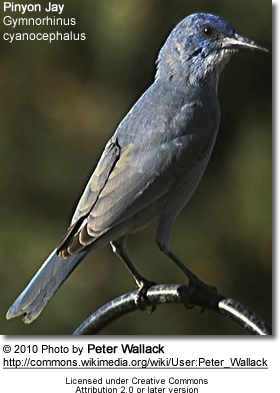 Pinyon Jays have shown to have a remarkable memory. These smart birds store thousands of excess seeds each year and have demonstrated their abilities to find these hidden seeds months later - even when covered under snow. Bonded pairs seem to coordinate their food caching so that the locations are known to each other. Outside the breeding season, these highly social birds are often found in large, loose flocks with as many as 500 birds that maintain a distinct social hierarchy, and they tend to remain in the same flock they were born into. However, the composition of the flock changes dramatically during the breeding season, when breeding pairs separate from their flocks. Pinyon Jays are resident in western North America from central Oregon south through eastern California and northern Baja California. They range east to Montana and western South Dakota and south to northwestern and east-central Arizona, central New Mexico, and extreme northwestern / western Oklahoma. Non-breeding vagrants are known to occur in southern Washington east through northwestern Montana and North Dakota - rarely as far as Iowa - and south to western Texas and Mexico (in the northern state of Chihuahua). Isolated Pinyon Jays been reported as far north as British Columbia and Saskatchewan in southern Canada. They inhabit and breed in pinyon-juniper woodlands and ponderosa pine forests (Pinus edulis, Pinus ponderosa, Pinus monophylla, Juniperus occidentalis, etc. ), and forests of mixed pine and oaks. Their preferred food items are the seeds of Pinyon pine trees, in addition to taking acorns, soft green food, fruits, juniper berries and other wild berries, cultivated grains (such as corn, sorghum, beans, barley, oats and wheat), lizards, snakes, the eggs and nestlings of other birds, and small mammals. They will also take insects and their larvae, including caterpillars, beetles, grasshoppers, ants and spiders. Nesting typically commences in late February and goes on until April. However, in some areas nesting may occur at just about any time of the year, as long as climatic conditions are favorable and food is plentiful. If these variables are met, a second clutch may be produced later on in the year (mostly around August). Pine Jays establish monogamous pair bonds, but may choose new mates if their previous mates are lost. The nests are typically placed close to their favorite food sources. Even though these birds always nest in colonies, there never is more than one nest in each tree (usually juniper, live oak or pine). The nests are generally 50 - 500 feet (15 - 152 meter) apart from each other and built an average height of 18.4 feet (5.6 meters) off of the ground. The large, bulky open cup nests are constructed out of twigs, shredded bark, grasses, pine needles and rootlets. However, they may incorporate anything suitable from their environment into their nests; such as feathers, horsehair, as well as paper, cloth, trash collected from urban areas. A clutch may consist of 3 - 5 pale blue, dark speckled eggs. However, in most cases a nest contains 4 eggs in average years and when food isn't readily available, three eggs or fewer are laid. The incubation lasts 16 to 17 days and is performed by the female. During this time, the male will take food to the female and guard the nest. As the young grow, other members of the flock may help feed them. The chicks fledge when they are around three weeks old. Their vocalizations include rhythmic and nasal "crauk-crauk", "kaa-eh"
Their life expectancy in the wild is about 16 years.